I want the OWA newsletter and free booklet, thank you! You CAN write what people LOVE to read. Let's move you toward your goals. Your readers will be mesmerized by your words. Bypass frustration, nessy trial and error, taking forever to get it right, even settling for "sort of right." Don't miss enjoying information about writing delivered to you for free in the newsletter. Get proactive with manuscript editing, classes and customized coaching, writing instruction books, publication guidance, and more. Move your work forward, whether fiction, poetry, non-fiction or persuasive copy. Demonstrate your authority, be a beloved part of the writing community, make money using your entertainment skills. 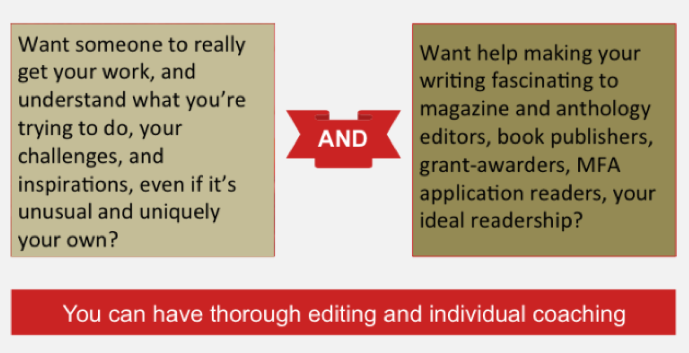 improve your chances of publication and writing related application acceptances and jobs. Let your characters live their lives vividly in the minds of your readers. Want to get more enthusiastic fan letters about your work from all over the world? Become a more luminous version of yourself, the great writer you yearn to be. Become your own imagination's fan. It's easy -- I can help you through email to find the best option to work together, if you like. If you don't see a drop down menu and you have something like Privacy Badger, disable it. Want the excitement of getting your work accepted to great publications? ​And great reviews if you self-publish? Then, consider the benefits of learning and manuscript editing with Tantra Bensko's Online Writing Academy. This is not generic instruction. It's personal, authentic, friendly, sometimes playful. Depending on the methods of instruction chosen, you have videos, audio, graphics, written lectures, assignments, self-paced or scheduled, interactive or classes you can do on your own, quizzes, checklists, slides, email exchange or formal class hosting, Skype, or local teaching, free or long term intensive study, editing, and coaching. Complete beginners, students in university and other schools, and successful literary professionals continually find this instruction life-changingly effective, year after year -- you can too. To help your writing shine so bright you can see your way clearly, get the Illustrated Chart Sequence PDF free by signing up below. You will be sent instructions in the response to your confirmation email on how to enter the free course and access gifts. This PDF contains high quality eye-popping images that will help you understand, enjoy, and vividly remember plot progression. "So glad that your writing academy is thriving, Tantra! You're a great teacher and writer. Onward and upward!" "I am becoming more and more excited about how my writing is evolving under your influence. I am exhilarated about our collaboration."